Believe it or not I often think "What do I ever make for dinner?" because some nights it seems as though I have no ideas or options. I forget about the arsenal of yummy dishes that I've made in the past and vowed to keep in our regular rotation. But once I think about it I recall my favorite go-to dinners and these huevos rancheros are definitely the newest addition to the weeknight meals served at the Waldman household - other weeknight wonders are frittata, lemon-tahini quinoa, noodle bowls, roasted veggies. Huevos rancheros are so easy to make, full of nutrition, and best of all, the ingredients are inexpensive (hello 2009 recession...). I did some research on huevos rancheros because I thought anything involving a tortilla, egg, and salsa counted - which is somewhat true. This dish is extra great because you can essentially eat/serve it at any meal of the day - breakfast, brunch, lunch, dinner, midnight snack! Huevos rancheros (Ranch Eggs) is a classic Mexican breakfast dish similar to Huevos motuleños which has become popular throughout much of the Americas. 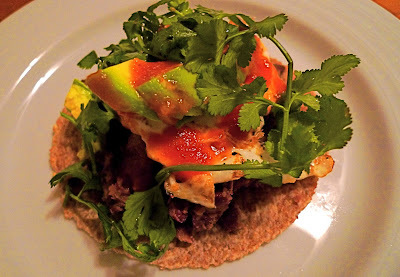 Huevos rancheros means "eggs ranch-style" or "eggs country-style" in Spanish. The dish traditionally was served at the large mid-morning breakfast, or almuerzo, on rural farms where workers had a much smaller meal at dawn. The basic version of huevos rancheros consists of corn tortillas fried lightly, and fried eggs with a tomato–chili sauce. Refried beans (frijoles refritos), slices of avocado, fried potatoes, and extra chili peppers are common accompaniments. Scrambled eggs can be used instead of fried eggs. Saute the garlic in a tablespoon of olive oil, in a medium skillet. Add in the drained black beans, cumin, and a 1/4 cup of salsa, salt & pepper. Let the beans simmer while you prepare everything else. Every few minutes mush the beans with the back of a fork. Put the oven on low and wrap up the tortillas in aluminum foil and heat in oven. Slice the avocado up into thin strips, squirt with lime & sprinkle with salt. Tear off a handful of cilantro and rinse / chop. Heat another skillet on medium and spray with the vegetable spray. Fry the eggs (don't forget to salt & pepper). When the eggs are almost done take the tortillas out of the oven and place on the serving plates. Top with the hot beans, then the egg, extra salsa, avocado slices, and the cilantro. Add another squirt of lime juice and/or a few dashes of your favorite hot sauce, if you'd like! i made this for breakfast/almuerzo yesterday! BEFORE looking at your post. whoa. amazing! great minds think a like :) and please know that guest tbl bloggers are always welcome!